Walk in the footsteps of the masons and laborers who worked the quarry at Government Island in Aquia, Virginia, to gather stone for the U.S. Capitol more than 200 years ago. On a cold March day, I decided to take a field trip back in time to a place where you can run your hands along history, and feel the marks left by masons and slaves who helped build the U.S. Capitol more than two centuries ago. Forty miles south of the Capitol, not far off I-95 exit 143, lays Government Island in Aquia, Virginia (Stafford Country). This hidden piece of land is home to a unique piece of history – in fact you could say it is home to the cornerstone of American democracy. 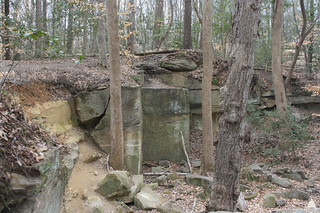 Government Island is a historic 18th and 19th century quarry site that provided Aquia sandstone for the construction of the White House and the U.S. Capitol Building. Pierre L'Enfant purchased Government Island on behalf of the federal government in 1791 to provide stone to build the nation's new capital city. On August 1, 1793, workers began digging the foundations of the Capitol Building and on September 18, 1793, George Washington laid the cornerstone of the building, which was Aquia sandstone from Government Island. The exact stone has been lost to history – today plaques mark the approximate location in the U.S. Capitol. Sandstone from this quarry was used for floors, walls, columns and the exterior of the Capitol. The Capitol's famous corn columns designed by Benjamin Henry Latrobe are carved from Aquia sandstones as well. However, work building the new Capitol was expensive and painfully slow. 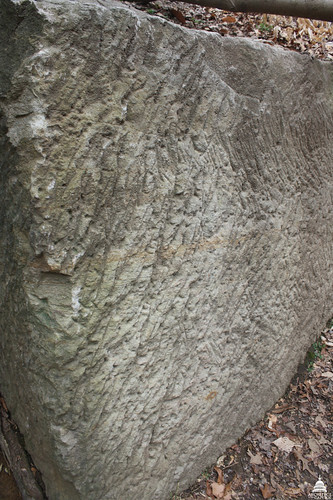 Tool marks from the 18th and 19th century are still visible on the stone in the quarry at Government Island. This was due in part to the cost of bringing the Aquia sandstone on boats up the Potomac – sometimes the stone would arrive unfit for use or the boats would be so overloaded they would sink. By the time House and Senate extensions were constructed in the mid-18th century, marble took the place of sandstone. Today, the site of this historic quarry is a recently opened public park with a beautiful boardwalk crossing wetlands teaming with gulls, ducks and other wildlife. As I walked in the footsteps of the skilled masons and enslaved laborers who worked the quarry, interpretive signs provided me with further information about the historic significance of the location. While the Capitol in its finished grandeur is awe inspiring – when visiting this quiet unassuming island on a cold March morning I felt even more connected to the history of the people who made America's temple to democracy possible. Government Island and its trail are maintained by Stafford County Parks, Recreation & Community Facilities. For more information visit: http://www.tourstaffordva.com/things-to-do/details/government-island.